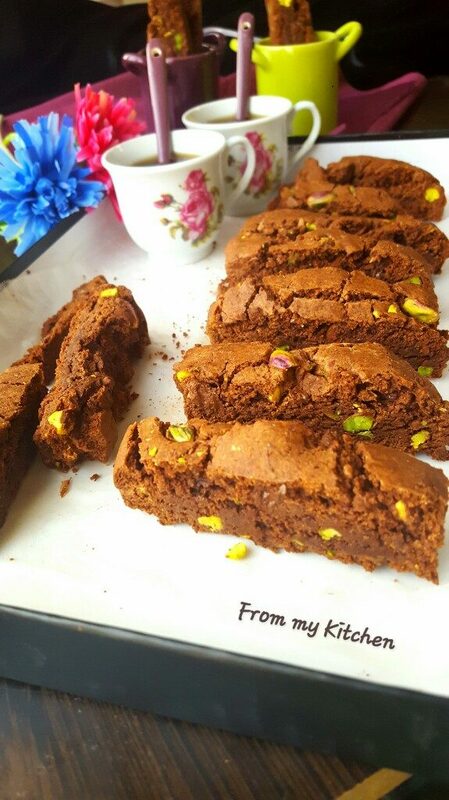 Whats better than this to have for your morning tea or coffee? 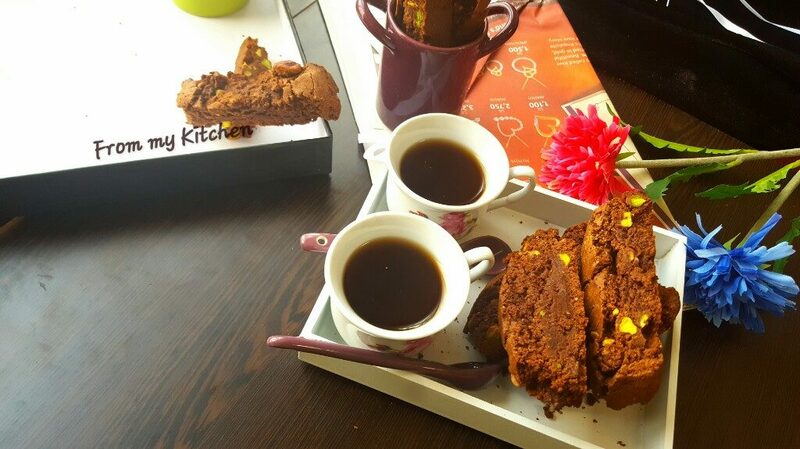 ?A crunchy,nutty,chocolaty goodness with the hot sip of tea or coffee will be a great start for the winter morning. 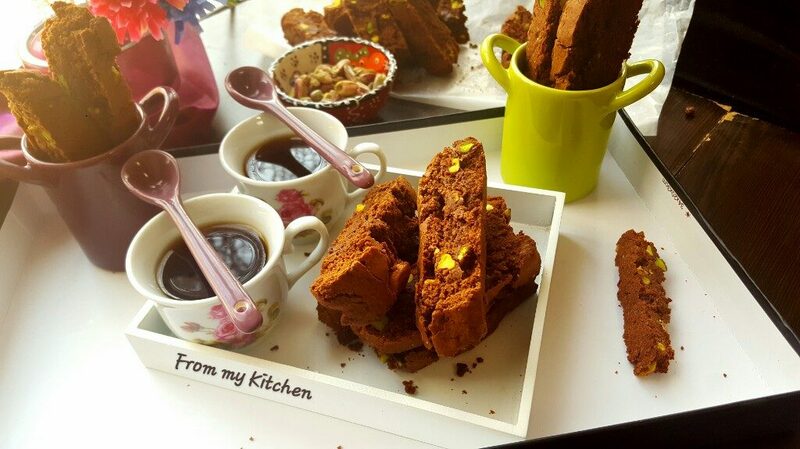 Biscotties are one of our favorite!If you start making and eating this i’m sure you will be addicted.. 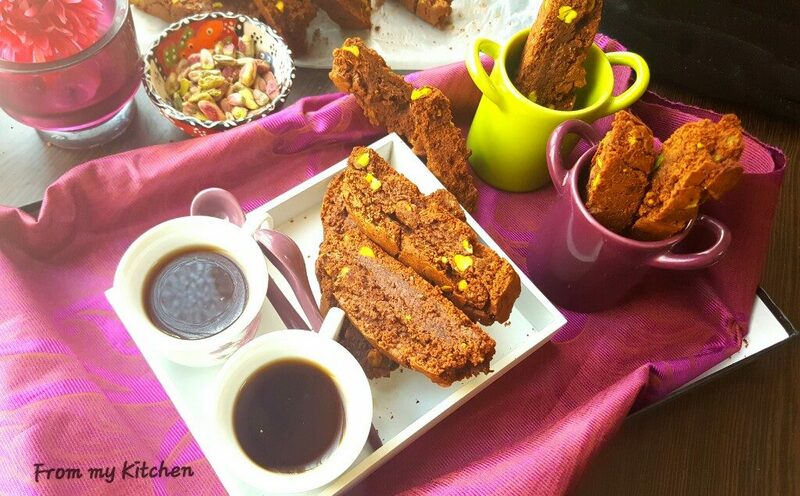 It has chocolate chips,pistachios and cocoa all the goodness that children can’t say no!I used to bake Almond Biscotti ,who ever had it from here loved it!So i tried chocolate version for my kids and they enjoyed it!Hubby like such,crispy,crunchy rusk like textures more than cookies!He said its like having a brownie crispies! 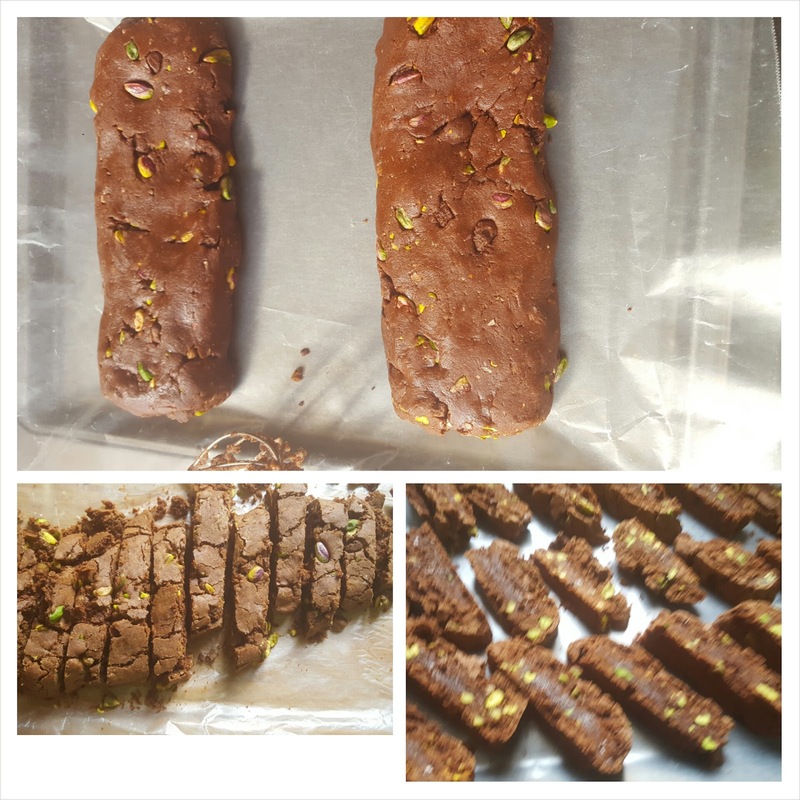 That green pistachios and chcolate color makes great combination isn’t it?How cute they are looking!For biscotties we need to double bake it to get that perfect crunchy texture.First make it to a log shape and bake it for 30 minutes.Then when its cool enough cut it into strips and bake it again. You can half the measurement…but i bet you will crave for more!Hehe! Mix together flour.cocoa,baking soda and salt keep it aside. In a large bowl with the help of a hand whisk,mix together melted butter or oil,eggs,vanilla,Then add powdered sugar in it and whisk until incorporated. Now gently mix the dry ingredients and when its half mixed add all the pistachios and chocolate then mix well. Knead it well with your hands. 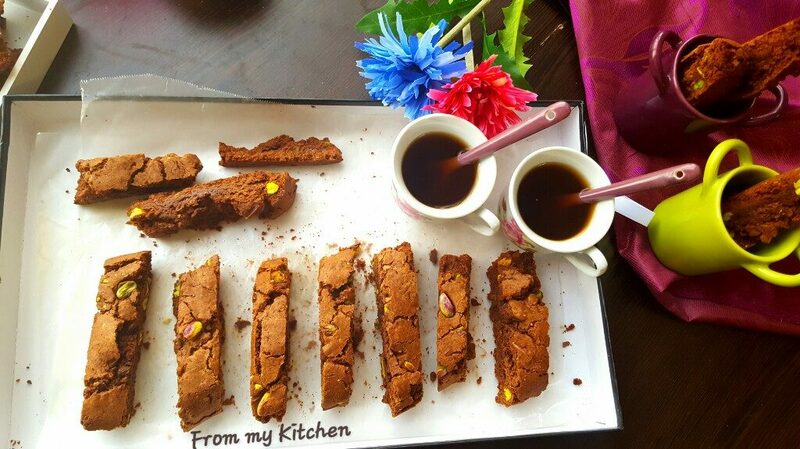 If its sticky sprinkle some flour and knead..
Make them into log shape and bake it at 180 degree for 30 minutes. 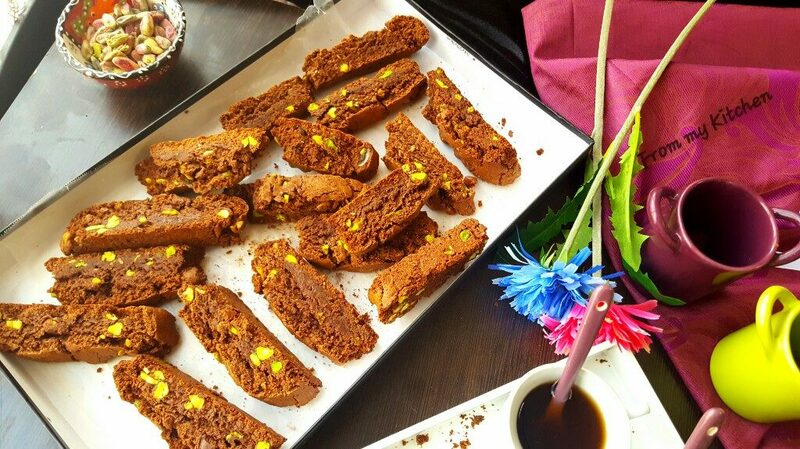 It will harden when its cool.Don’t bake more than that otherwise your biscotti will get very hard. 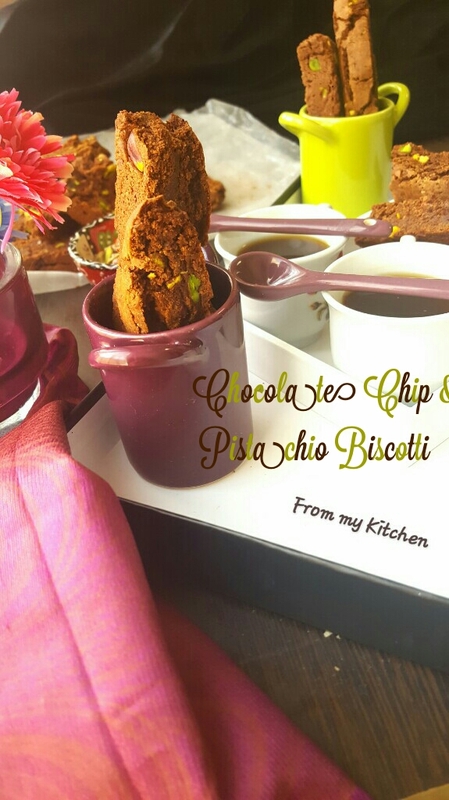 I’m sure kids and adults both will get addicted to this crunchy,chocolaty yumminess!In between that extra crunch from pistachios and the melting texture of chocolate chips was heavenly! 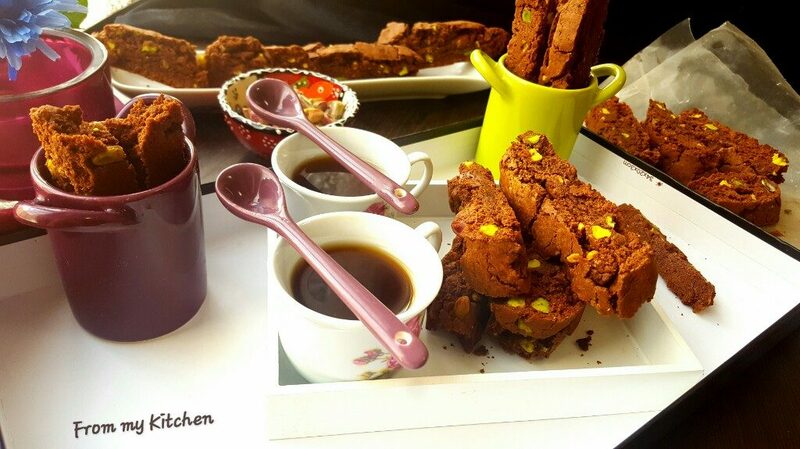 Dip it in coffee and enjoy your chilly day!